It was quite a birthday party for 'our Graham', husband, father, grandfather, friend and pastor. He's served in five parishes, including two that we have been members of (in Streatham where Graham was my vicar and in Redhill where I was his). So many of us there today have had lives touched by Graham's ministry, and to many of us - although he would find this a strange thought - he is a kind of hero. It's easy to underestimate the impact of a local church faithfully preaching the Gospel. There was quite a group of us there today who were all members of St James, Streatham in the 1980s. Some are still there and that church continues to flourish, but the rest of us are dispersed around the country, involved in other churches, labouring for the Gospel in different places, and not just nostalgic for those happy days in Streatham, but indebted. That's how Graham and Jill have lived. 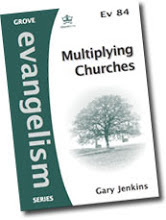 They have given us an extraordinary model for Christian ministry. Ascensiontide preachers at St James have a giant visual aid to assist them. It is 11 feet wide, 23 feet high, and it has dominated the interior of the church since its installation in 1846. Together with its text 'Lo, I am with you alway' taken from the King James Bible (Matthew 28.20), the painting is greatly loved by Bermondsey people. 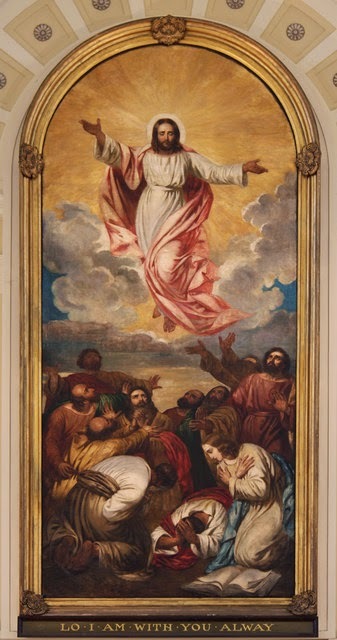 It orginated in the bequest of John Harcourt, one of the church's founders, who on his death in 1839, left £500 for a painting of the ascension to be placed over the communion table. Whoever first applied the text to the painting knew their Bible well, recognising that the passage we call 'the Great Commission' - which ends 'Lo, I am with you always' - comes from Matthew's account of the Ascension. And in so doing they gave the painting a particular spin - a mission spin, pointing us out into the world to 'make disciples of all nations' and to discover in the process that Lord is with us always. 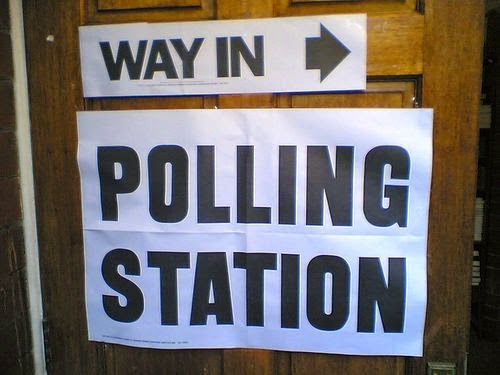 It's good news for the two existing councillors in the north of our benefice - in Riverside Ward - who were standingfor re-election. Anood Al-Samerai and Eliza Mann were both re-elected, and are now joined by a new councillor, Hamish Mcallum. In the south of the benefice, in South Bermondsey, there is a new batch of councillors: Catherine Dale, Sunny Lambe, and Leo Pollack. Congratulations to them, but commiserations to Graham Neale, Paul Kyriacou, and Michael Bukola who have served the area well for the last four years and who were narrowly defeated this time round. Let's pray for all our councillors and council as they seek serve the community here in Southwark. To the Salmon Youth Centre for our joint PCC (church council) awayday for the united benefice of St James and St Anne's. Both church councils have recently agreed a Mission Action Plan and today's meeting was going to be all about implementation or, to put it another way: what are we going to do about it? We began with the Parable of the Talents. It was the man who buried his talent in the ground and did nothing with it who got it in the neck from Jesus. Where did he go wrong? The group said: (1) he was afraid to take a risk; (2) he didn't do anything with what he had. Spot on. That got us off to be a good start. We needed to be prepared to take a risk. We need to actually do something with what we have been given. So then we got stuck into thinking about the 14 targets or projects we have set ourselves for the next five years, spending quite a bit of time in groups looking at eight of these projects and asking: what needs to be thought about and what needs to occur to make it happen. Lots of good stuff came from the groups and now we have a got loads of ideas to work on, as we seek to implement our five-year mission action plan. May God grant it will happen! 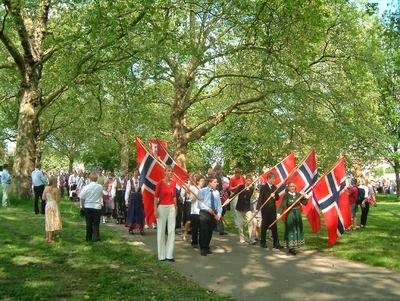 Meanwhile, Southwark Park was festooned with red, white, and blue (but not the Union Jack) this afternoon as London's Norwegian community gathered for their annual Constitution Day celebrations in the park, reflecting Bermondsey and Rotherhithe's long-term connection with the Scandinavian countries, going right back to the days of the Surrey Docks, and maintained to this day by the present of the Norwegian and Finnish churches (the former being the focus of today's events). For the last few days your blogger has been undergoing training. They've been training me to be a trainer. Every vicar receiving a curate (trainee vicars) this July had to attend this week a two-day residential training course at the diocese's retreat house, Wychcroft, set in beautiful country side near Godstone in Surrey. 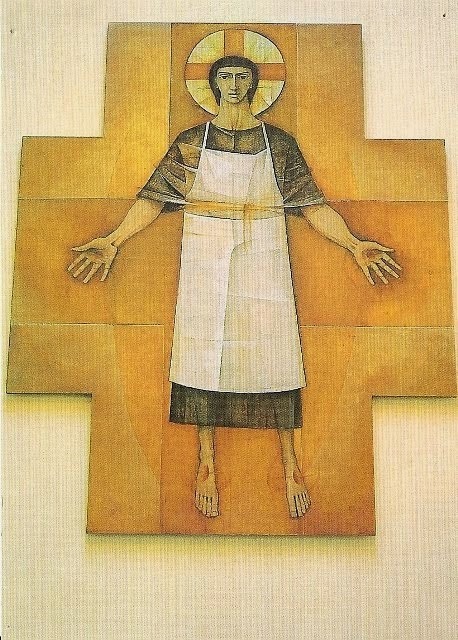 It was a good time to think about the best way to give curates a really good training experience in their first post after ordination. Whilst there it was also good to worship in Wychcroft's beautifully simple chapel (a converted barn), dominated as it is by this striking picture of Christ the Worker which I have always loved. That linked in very well with tonight's Bermondsey Christian Training, brilliantly led by Nick and Parisa, on the theme of living for God at work. They made the point that God himself worked. The Wychcroft painting makes the point that Christ himself worked. And the Bible tells us - and Nick and Parisa pointed this out - that everything we do, we can do in the name of the Lord Jesus. To a corner of St James's parish that I haven't previously visited - the floating part. 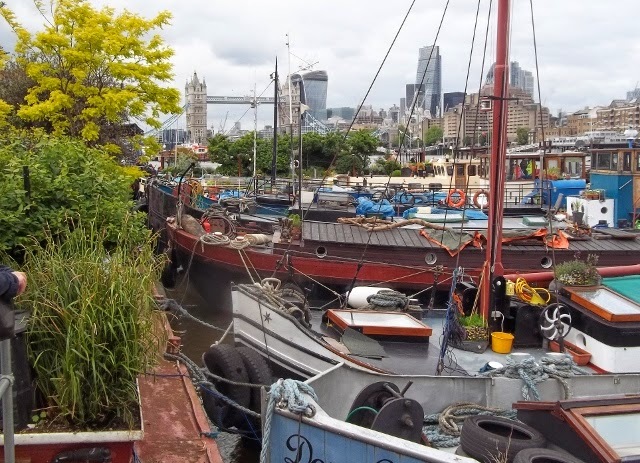 With the parish boundary running down the middle of the River Thames, the residents of Tower Bridge Moorings, just off Bermondsey Wall East, are parishioners - and today their wonderful 'garden boats' were open to the public as part of the National Gardens Scheme programme of garden openings. 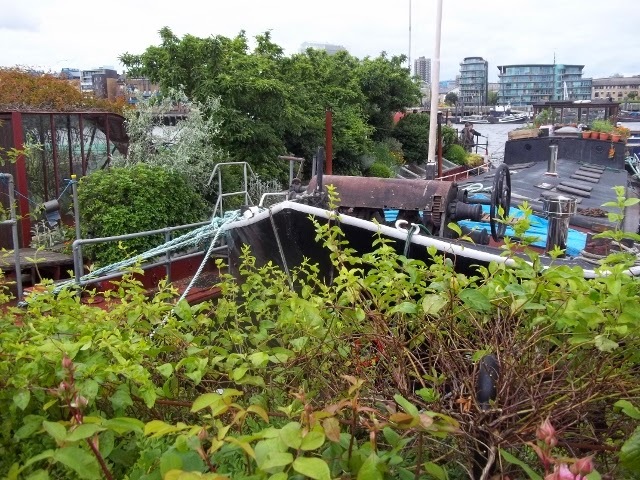 The weather could have been kinder, but the views are fantastic, and the gardens, gradually cultivated on top of the barges since the mid-1990s are stunning. 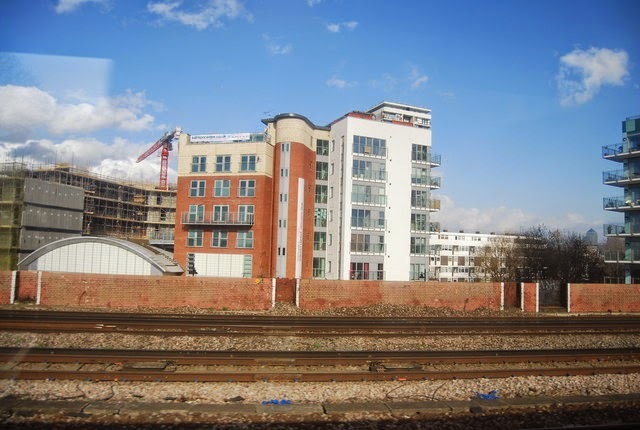 It was good to meet some of the residents, including a youngster who has just started at St James's nursery who had told her teacher on arrival: 'I live on a boat.' She does! The river can get quite choppy, and some residents can only access their homes by clambering over other boats, so a sense of adventure is pretty much a requirement. You also need to like rivers - and gardens - but you do have the most fantastic views. A group from Bermondsey Voices our local community choir which meets each week in St James's, joined us for our communion service this morning at St James. New members are always welcome - contact Kristina, their leader. It was great to have them with us, singing before the service (Soon and very soon), during communion (Panis Angelicus and Amazing Grace) with a rousing number from Zimbabwe at the end. 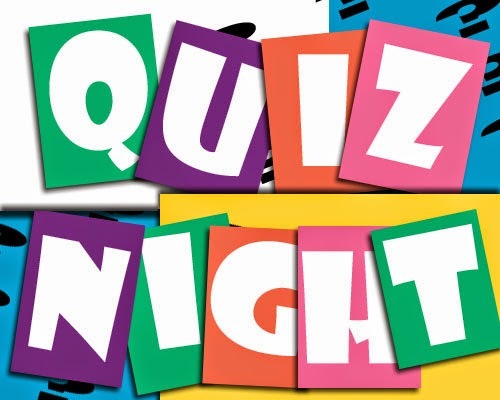 Another great community event was our united benefice quiz night at St Anne's Hall last night, brilliantly led b by Paul and Mandy, with fish and chips supplied by the shop in Jamaica Rd who have enriched so many sessions of Bermondsey Christian Training. The winning team? It has to be said your blogger was a member of it but in all truthfulness most of the credit for this outstanding victory must go to the rest of Team Daisy - including Daisy herself (Disney specialist). If there's one thing that people know how to do well here, it's a funeral. Family matters a lot in Bermondsey and a good funeral is a way of saying how much someone matters and how much they were and are appreciated and loved. A good Bermondsey funeral quite often takes place in church, there may be a horse-drawn hearse, there will be more flowers than you have ever seen in your life, the minister and funeral director, usually Barry, will walk in front of the cortege all the way through the Blue, there will be lots of tears, and quite a bit of laughter. Maybe an opera singer will sing, and quite likely there will be the release of doves at the end. Today's funeral in church, beautifullty planned by Lynn and her family, had a lot of those elements. The Pearly King and Queen were in the congregation alongside a church full of people. Music ranged from the 'Old Rugged Cross' and 'Jesus wants me for a sunbeam' to Nessum Dorma. Best of all were the heartfelt tributes to a beloved husband, father, and grandfather which were greeted with applause by the congregation. And then there was the chance for me to speak the words of eternal life. The funeral service, I told the congregation, takes us on a journey from earth to heaven. We begin by giving thanks for the life of the person who has died and then we move on to think of the reality of the life of the world to come. Thank God that Jesus is the way and thank God for a proper Bermondsey funeral. Yesterday to the Borough of Camden for the annual UNLOCK sponsored walk. Its run on as shoestring and its annual urban walk in London attracts up to 700 walkers and around £25,000 for its funds.The check points for the walk are local churches who open their doors to walkers, offer refreshments, and offer information about church life. This greatly contributes to the fascinating experience that is every UNLOCK walk. 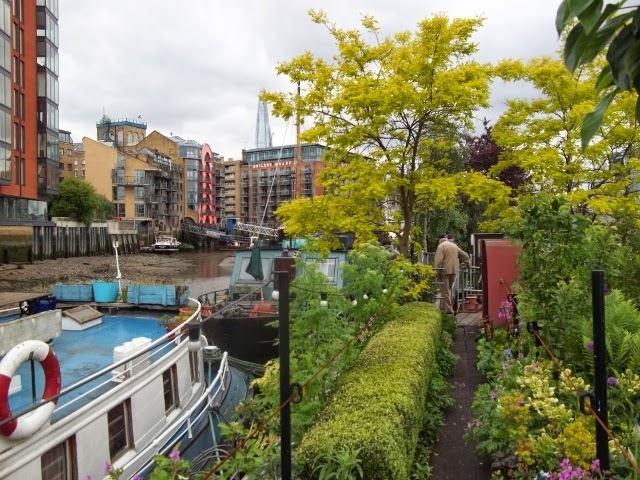 In 2007 the walk was in Bermondsey and the Isle of Dogs and that was the occasion I first visited St James's Church, little suspecting that within five years I would be a Bermondsey vicar. 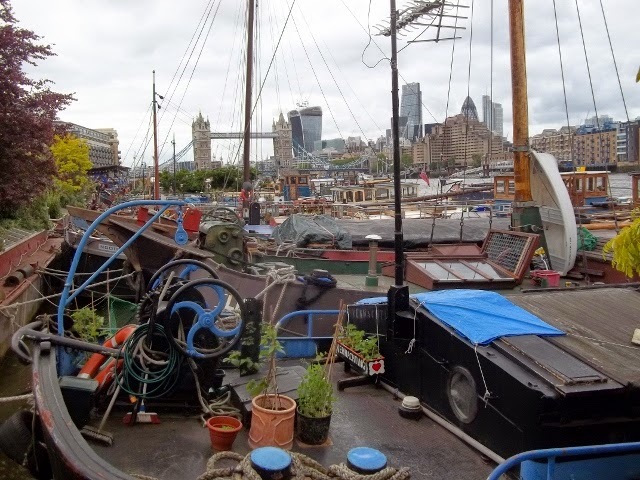 This year's walk, the thirty-first, took in Camden Lock, two prisons (Pentonville & Holloway), a stretch of the Regents Canal, and an extraordinary mixture of very wealthy and very poor housing, with churches of all shapes and descriptions ministering in very diverse communtities. Next year's walk is on 25th April. Why not join ?